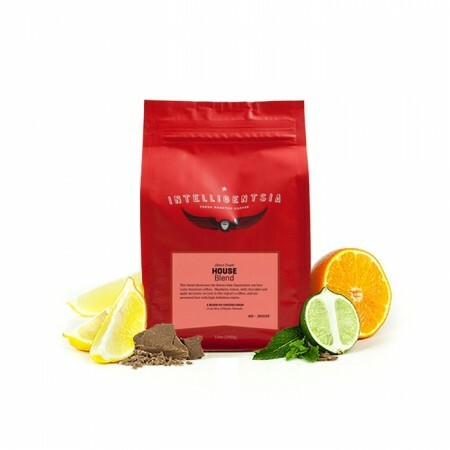 The House Blend was blended and roasted for you by Intelligentsia Coffee. Intelligentsia's House Blend is designed to showcase the intrinsic sweetness and lively fruit flavors that characterize their favorite coffees. Milk chocolate, mandarin orange, and apple acidity are tastes we love and are presented here with lots of flavor clarity. It was smooth and tasted like decent enough coffee, but I just didn't really pick up on any of the citrus or chocolate-Pretty bland. I really enjoyed the smoothness and the roast level was perfect. The coffee was light and the flavor bites were exactly as described. I would say the only thing I wasn’t extremely fond of was the overly citrus flavor. I usually enjoy a fruity naturally sweet coffee. This one had almost too much for my tastebuds though. Thank you! This blend isn't bad as a pour over, but definitely not what we were hoping for from Mistobox. We joined to try more specialty coffees from roasters new to us, so it was a little bit anticlimactic to get a basic house blend from a brand we can find at Target. We're super excited about our next coffee, though! Definitely understand why it’s their house blend. A predictable light roast with pronounced citrus and chocolate notes. Extremely pleasant but not particularly interesting. Perfect morning coffee - not intense and very well rounded. Well done. Fruity / Flowery, and smooth. This blend seemed to have more flavor clarity than other blends that I have tried. Used with American press and pour over both were very good. I picked up on the notes of apple and orange, which was interesting. Overall a great cup, and excellant roaster. I really like this for cold brew. Personally, still need a dark roast for hot brew. I really like this coffee! It is light but still has a good flavor. It isn't too strong but it has a great smell and taste. Nothing is overpowering, but it also is more complex then most coffee I drink. I liked that it was smooth as well. Loved the smooth and balanced blend. Liked that there is no string after taste. Perfect morning coffee, light and easy to drink. Definitely balanced, good flavor but not overwhelming with any specific flavor. Solid blend. Was not bold enough. I prefer a stronger more intense flavor. Is it possible to have it sent already ground.? My grinder does not grind well enough for filter coffee. Pretty solid cup of coffee. Tends to get a little too sour as the coffee cools, but I’m still impressed with it. A very clean tasting coffee with just the right amount of chocolate and citrus hints. It is not too roasty, yet not too light as well. With a dribble of milk and stevia sweetener, it is the most balanced cup of coffee I have had so far. This may be my go to coffee. I like it slightly more than Kaldi's Breakfast Blend. I was a little disappointed in this one. On the good side: I didn't detect any bitter flavors in it. But it was also VERY mellow in flavor, almost to the point of disappearing. The smell of the roasted coffee was great, but after brewing it just didn't seem like there was much left. The beans were a little lighter than I prefer. FWIW, one of my all-time favorite coffees is Stumptown's Holler Mountain blend. I made this too diluted at first and wasn't super impressed, but then made it the right way for a second cup this morning! Loved it. So happy with this blend — the description is accurate (I definitely taste chocolate and orange). perfect for my taste palette please send more like this! It was a very smooth coffee. However the notes weren’t very strong when we made it as pourover. We like coffees with a little more flavor. We ended up making it as espresso and that brought out the tasting notes a bit more. Intelligenstia is always great — even their blends.